It was decided that we would all meet in a couple of weeks to try the cure. We knew it was going to be tough on Danny and Erin to do this disgusting thing, and we all wanted to be there to support them and take pictures and point and laugh. There was one of our number who took pity on them, however. He alone saw the test they were about to endure and knew the opportunities it presented. Only he had the clarity of vision to understand the very specific nature of the party we were planning and what it could mean for him personally. Pete and I became friends during High School and prior to getting married, Pete was my roommate in college. It was during the time we were living together that he ate what was hands-down the most disgusting of all the things he’d ever eaten. Pete: I’ll do it too. Me: But you don’t even have asthma. Pete: So? I wanna try it. His working theory was that if onions and sugar cured asthma in those who had it, maybe the combination would GIVE asthma to those who didn’t. (I don’t think I should have to remind you that there is no science in this story.) In any case, Pete was willing to find out. The following week, everyone gathered once again at our apartment. Michelle and Ryan, Aaron and Amy—about a dozen people showed up to watch the spectacle. Danny, Erin and Pete had each selected their onion. Pete’s was the biggest, followed by Erin’s. Danny’s was the smallest. We wondered if the size differentials would affect the results and figured it was worth testing it out. Pete’s thinking on choosing the biggest may have been a little different. The more disgusting the better. 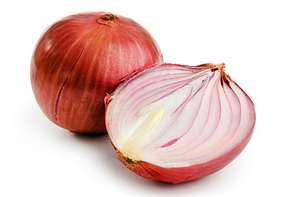 Before we could do anything, we had to decide how exactly to prepare the onion with only Danny’s vague recollections of Paco Jose’s story to go by. Do they eat the half with the baked, caramelized sugar AND the spare half? Or just the half with the sugar? We decided that eating a half onion with the carved bowl of sugar in the middle would be enough. We wrapped foil around it to insure stability while it was in the oven. Once the onions were done cooking, we brought them out to the coffee table in the living room and everyone gathered around the test subjects as they readied themselves for consumption. Danny’s wife Danielle had prepared an elaborate, seven-layered dessert just for the occasion. A concoction of chocolate, whipped cream and graham cracker crumbs, it was to be the delicious reward for out test subjects for getting through the ordeal. “GO! GO! GO! GO!” we chanted as the three of them chowed down and ate and ate. They cried, they winced, they smelled awful. To their credit, they each got through it.